I don’t see any reason why a higher intensity intervention would not also be a “good thing” when treating children with a phonological disorder and indeed this is what Williams (2012) concluded when she reviewed data from her lab. After a quantitative summary of treatment outcomes for 22 children who received her multiple oppositions intervention she recommended a minimum dose of 50 trials over 30 sessions with anything less being ineffective and higher doses (70 trials or more) being necessary for the most severely impaired children. In this case the children received 30 minute sessions twice per week. Recently we have been conducting single subject experiments with children who have CAS and although treatment intensity is not the primary focus of attention in these studies my doctoral student, Tanya Matthews, and I have been looking at the relationship between dose frequency and outcomes. 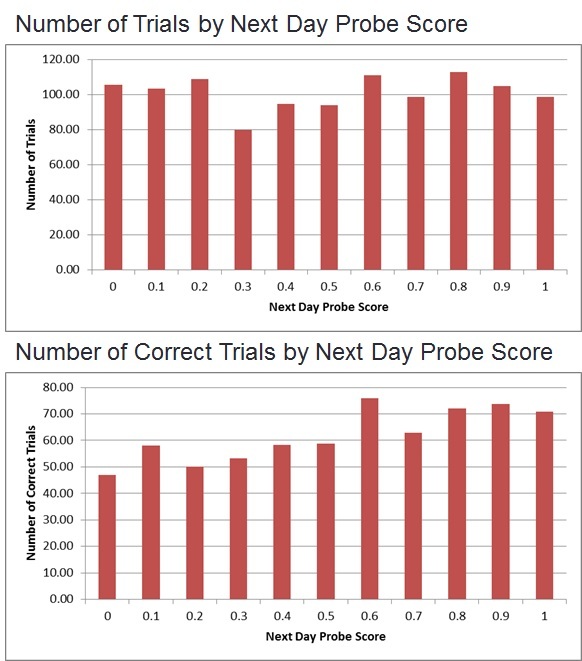 In the figures shown below the children’s “next day probe scores” (an indicator of maintenance of learning over a short-term period, expressed as proportion correct) are shown as a function of the number of trials completed (top chart) as well as the number of correct trials in each session (bottom chart). There is not much variability in the number of trials per session because we put a lot of pressure on the student SLPs to keep this number high. However the number of correct trials varies quite a bit depending upon the severity of the child’s speech delay and whether it is early or late in the child’s treatment program. The lower chart shows that next day probe scores are better if the number of correct trials in each 20 minute practice session is above 60. The number of correct trials never goes above 80 because we are working to keep the child “at challenge point” so if the child begins to produce more than 80% correct trials we make the task more difficult. However, if the child is producing many errors it does not really help to keep the response rate high either because the child is just practicing the wrong response anyway. So to sum up, notwithstanding the rather poor quality and quantity of the data, my impression is that dose counts: regardless of whether the child has a motor speech disorder or a phonological disorder it is important to achieve as many practice trials as you can in a treatment session but it is also a good idea to ensure that the child is achieving accuracy at the highest possible level of complexity and variability during practice as well.